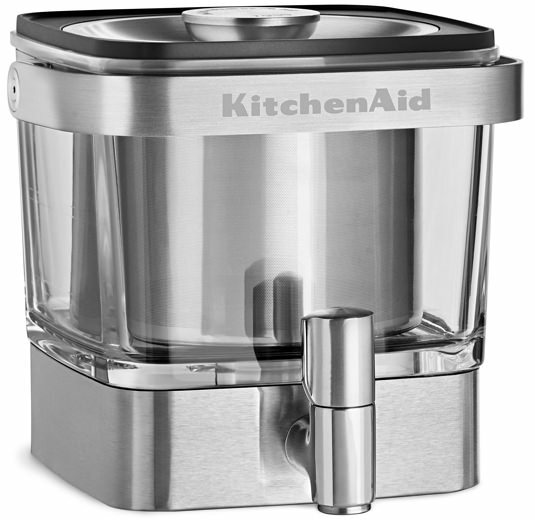 KitchenAid Cold Brew Coffee Maker | Valet. Treat yourself to a smooth and balanced cold brew at home. Way better than chilling traditionally hot-brewed beans, cold-brew coffee is steeped for an extended period of time at room temperature, leeching a slightly sweeter, less acidic flavor from the grounds. Gone is the bitterness—replaced with all of those rich caramelized background flavors coffee snobs like to brag about. Which could explain why the concept has hit the mainstream. Want to make cold-brew concentrate in your house that's as delicious as any you'll find at the store? KitchenAid's new coffee maker is the best brewer for the job. The handsome, streamlined design is built from stainless steel and glass—which means it's not only durable but the components help preserve the taste of the coffee as well. 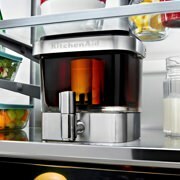 With its streamlined design and small footprint, the brewer easily fits on most refrigerator shelves. And the built-in stainless steel tap dispenses your brew quickly without a mess. Fill level indicators make brewing as simple as adding grounds and water. Make up to 14 servings at a time (which will stay fresh in the fridge for two weeks). Then simply mix two ounces of your cold brewed concentrate with six ounces of your favorite milk, water or ice. And while it's a touch pricey, it's built to last and if you regularly buy your cold brew, this will practically pay for itself after only a handful of batches. Chameleon Cold-Brew, the Austin-based purveyor of organic coffee, just introduced an at-home brewing kit ($15.99 for eight pods and a mason jar) which yields four batches of cold brew concentrate or eight full-strength servings. Like coffee? Then heed this advice to make a pro-level cup at home. Make a cafe-quality cup of coffee with this handsome Japanese brewer.